Family friendly, totally restored this walled in property with inviting outside dining areas and a mature Mediterranean garden, features a huge saltwater pool (means low and regular output of natural chlorine. Chlorine created from salt is very gentle to skin, hair and swim suits) with lots of lounge space an a view over Puig d'en Missa into the sea. The communal living areas that connect the various bedrooms is spacious and open for sharing with family or friends. Living in the countryside and yet within walking distance to Sta. She is a painter, he is a businessman and art collector When a house is old it has a spirit that no new house can offer. 200 years ago people were building with real stone and by hand, and when we renovated in 2015 we kept the signs of times, added more comfort but in the spirit of using natural materials authentic materials. You will feel at ease and cosy, as this is not just an ordinary, anonymous rental property but our home that we let for a limited time of the year to likeminded People. This village is the gate to the more relaxed North East of the island. Its more green, more lush and much less crowded than the south. Bathroom 1 - ensuite, large walk in shower, bathtub, bidet and big sink. Bathroom 2 - ensuite, shower and sink and dressing. Bathroom 3 - WC and sink. Bathroom 4 - ensuite, shower, sink. Bathroom 5 - ensuite, shower sink. linnens are changed on Saturdays means if you stay one week there is no linen change during the week only on special request and at your expenses. towels are changed on Saturdays means if you stay one week there is no towel change during week only on special request and at your expenses. Large open area divided in cosy TV space with sofa and chimney , spacious entrance leading to the dining area with wooden table for 8 open towards the kitchen area. Big industrial Kitchen with island, fully equipped with 2 fridges, gas stove, oven, 2 sinks, microwave, dishwasher and all the utilities for creative cooking and sharing diners. Roca Lisa Golf 10 min away. Outside: You enter the premises through a electric gate, the walled and fenced in property is set in a luscious Mediterranean garden (matured palms, bougainvillea, vines, pomegranate, apricot, lemon, orange and lavender. We have a little vegetable garden for our guests. Around a 7x18m pool and baby pool a shady bougainvillea covered terrace and hammock with sitting area on one side, and on the other oversize chill lounge beds and sun beds. Utility Room: Washing machine and Dryer. Cleaning / Towels / Linen / Maid service: linen and towels all white cotton (including towels for pool) are changed once a week , cleaning 2 x a week. Further service upon request. Other: both covered terraces, one next to the kitchen entrance and 1 towards the pool are both equipped with large tables and chairs. The one by the poolside with outside kitchen and bbque. My family of 7 adults and 2 children stayed for 1week and must say we had a lovely holiday celebrating my 60th birthday. There was everything we could need to make a relaxing and comfortable stay. Dear Graham thank you so much that you did take your time to write about us. We were very pleased with you as our guests and would always welcome you back with great pleasure. We are very happy you appreciated our garden. We were 2 families including 5 children. The house is beautifully decorated with lovely areas for eating all together. However the best part is the incredible pool and surrounding chill out areas. Great location and a very helpful host. We could not have wished for better. We spent 7 wonderfully restorative fun days in this peaceful and well appointed home. We are 2 families with 4 children between 5 and 12 years old. There was space, light, comfort and privacy. The views are uplifting and the renovation and interior of the property is very special. The soul of the home can be felt and the personality of the owners is apparent at every turn - in this case it was a joy! The description and photos are exactly as you find it - if anything real life is even better. Ernesto - the man who cares for the property is also kind and helpful and very discreet. The owner, Caroline, was personable and helpful with all requests - babysitters, other areas that would be nice to stay and visit and made sure we had all our needs met. The garden is big but safe enough for the kids to play games, have adventures and run around! The vegetable and fruits were ripe and we were encouraged to use them delicious! The kitchen and various eating areas were also fully equipped for large family meals or quick snacks. The pool area is also large and relaxing to while away the hours day or night. We did not want to leave and all agreed it is the best holiday house we have ever stayed in. Many thanks and please let us know if you ever want to sell!! Was great. The villa is beautiful and well kept. an old Finca that has been sympathetically restored, with great pool and comfortable with the way natural breezes air condition it. Housekeeping was perfect, and we really enjoyed our stay. You need to like the neighbour's dogs who seem to be trained to yap a lot, but this is generally a quiet residential neighbourhood but close anough to town to walk to the restaurants, shops, and nightlife. with the compliments you made on our property. You were a pleasant guest and we will be happy to have you back in the future. We do apologise for any inconvenience you had about the neighbour's dog (currently we are trying to find out what happened during the time you stayed). 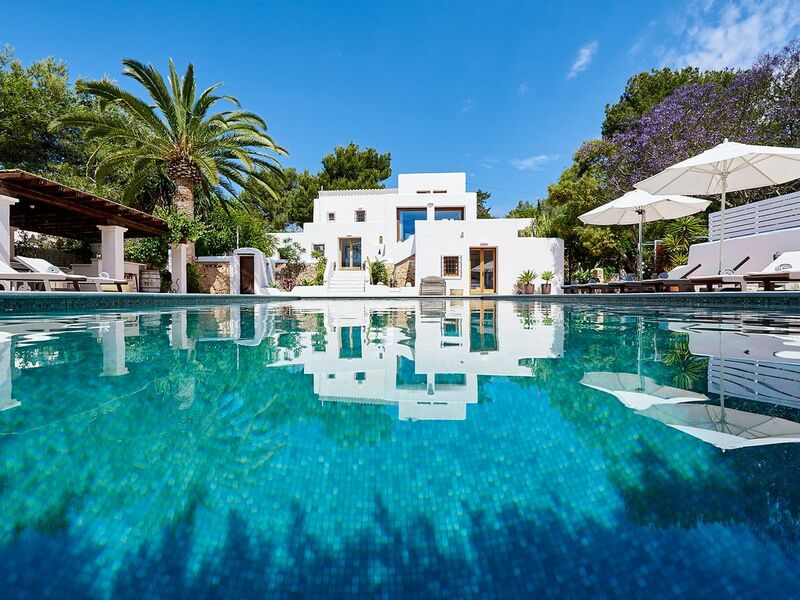 Indulge into authentic country side restaurants, visit spectacular beaches of the east and north, sparkle to the night life in the nearby famous restaurants, beach clubs, La Paloma, Bambuddha, Amante Beach, Atzarro, go horse-riding or play golf, visit Las Dalias Market, enjoy a dinner at your poolside all is possible in Ibiza. Close to beautiful beaches such as Aguas Blancas, Cala llena, Sol d'en Serra, Pou des Leo 10min. Salinas and Es Cavallet 20 min. Airport 20 min, own transport recommended also available public transport such as buses and boats. Walking distance to Sta. Eulalia 5 min. Beach 10 min. Golf, diving schools, cycling and mountain biking, sailing, fishing, kayaking, walking, horse riding, tennis, yacht and boat charters are all available in the area. 4 of the best spas of the island are 5 min. drive away. Booking Notes: Please contact owner. Changeover Day: Saturdays, please contact the owner for exeptions Notes on prices: Security deposit requested.